A federal official responsible for border security discussed how his private sector experience prepared him to manage the increasing demands of an agency that operates under close scrutiny during the 3rd Annual Border Protection Innovations and Technology Forum hosted by the Potomac Officers Club. 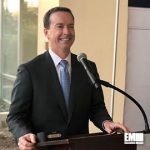 John Sanders, chief operating officer of the U.S. Customs and Border Protection (CBP), was the keynote speaker for an event that brought together leaders from the GovCon sector. In his position he works with the commissioner to identify the operational requirements of the agency, and to provide strategic direction and oversight of enterprise services and operational support components. When he was hired as COO, Sanders was initially given a list of 13 priorities to focus on, and he asked for a shorter list. The final tally was pared to six: supporting front line security agents, hiring agents, IT modernization, enterprise data analytics, innovation and border security. Prior to joining CBP, he served as the Transportation Security Administration’s Chief Technology Officer, where he oversaw development and implementation of risk-based analyses to enhance transportation security. His private sector experience includes co-founding Reveal Imaging Technologies, a leading threat detection and screening systems solution provider that was acquired by SAIC. Border security officials deal with a high attrition rate, but in 2018 the CBP hired more agents than they lost to attrition for the first time in five years. The onboarding process for new hires also improved. Five years ago the agency required 400 days in “time to hire” an agent. Applicants undergo a polygraph and a background check, and officials did not want to lower their hiring standards. Now the period is reduced to 270 days, but Sanders strives to continue reducing the hiring time. Sanders possesses more than 30 years of experience in the national security sector. His time in the private sector includes work with three startups so he looks to industry partnerships to increase efficiency. Hiring the right people and accelerating the hiring process continue to be major priorities. When 4,000 individuals are in custody at the border, officials consider that figure to be cause for concern. When it reaches 6,000, officials call it a crisis. Sanders said there are now 12,000 people in custody, primarily in border patrol. Border agents are dealing with the changing demographics of individuals who attempt to cross. Until 2008, 90 percent of individuals were from Mexico, and until 2011 90 percent of individuals were single adults. In February 2019 76,000 people were detained by border security, typically a slow month, according to Sanders. On average over a 21-day period 100,000 people attempt to cross the border. Within that 100,000 figure are an estimated 9,000 unaccompanied children. Sanders said the number of unaccompanied children could rise to between 12,000 and 15,000 in the coming months. Sanders said CBP is the “tip of the spear” whereby border security agents must coordinate with other federal agencies when individuals are taken into custody. He emphasized that border facilities are not set up to serve as long-term detention or health care sites yet the volume of people crossing the border continues to rise, putting a strain on resources. When individuals are apprehended at the border it takes 11 hours before border agents notify ICE or HHS. An individual who is detained at the border spends an average of 65 hours in custody, and officials want to reduce that time. “If there is a way to streamline that process, we would like to hear about it,” Sanders said. Sanders made a recent visit to a border security site and was impressed with how the agents handle the stressful job demands. On April 10 the Potomac Officers Club will host the 2019 Data Management Forum. GovCon leaders from the public and private sector will address the great challenges related to data management.